As is the case for many fans of Star Wars, The Phantom Edit went a long way toward rescuing the original Phantom Menace for me. 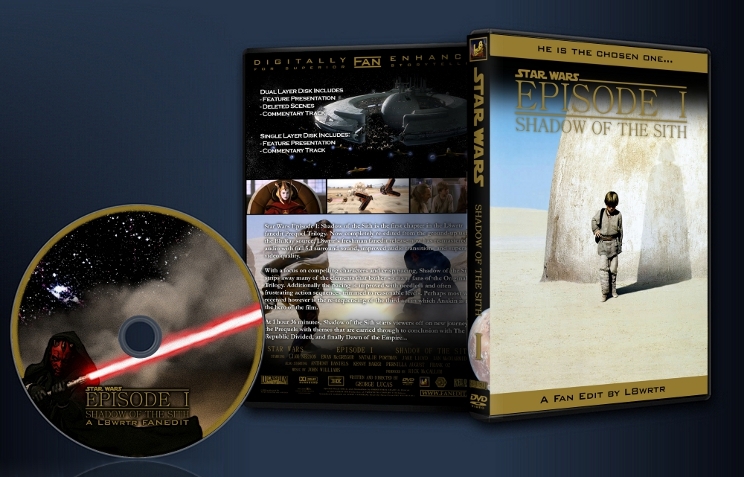 For a long time both it and his follow-up edit of Episode II were my ‘definitive’ versions of the films. With Nichols choosing to never release an edit of Episode III I began playing around with the idea of editing it myself. I'd never edited anything before and my first attempts were crude at best, but over time I refined my ideas on how the PT could be concluded with a stronger, more compelling final chapter. Technical/quality issues with my early drafts led me to fanedit.org where I found the expertise and assistance needed to resolve the challenges I was facing. By that time however I'd come to understand just how much could be achieved with fanediting. No longer could I be satisfied Mike Nichols' releases. I realized that these movies could be cut deeper, that more nuance could be applied within scenes to change tone and improve dialog, which improves character and audience reaction. 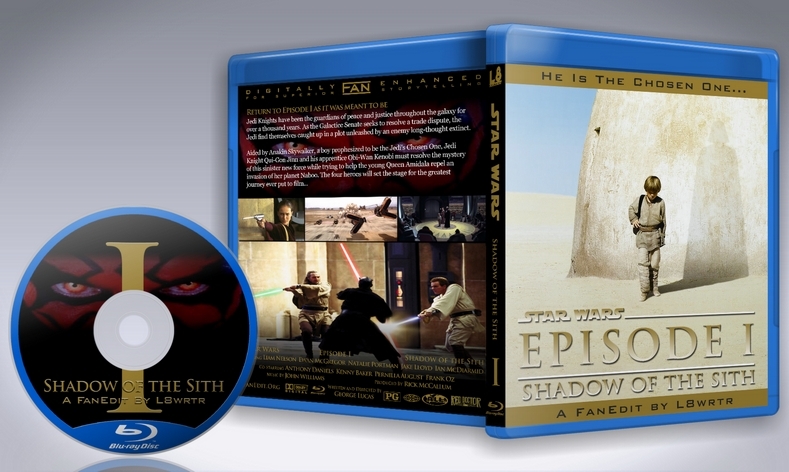 With that in mind, and with a clear end-point of how the entire Prequel Trilogy would be concluded, I postponed re-working my Episode III edit and turned my eye to the full Trilogy. With this new purpose I sat down and created three overal priorities or goals for each edit. 1) Improve the story told within the film itself as much as possible, making the characters more likable/interesting, and making the plot more engaging and enjoyable. 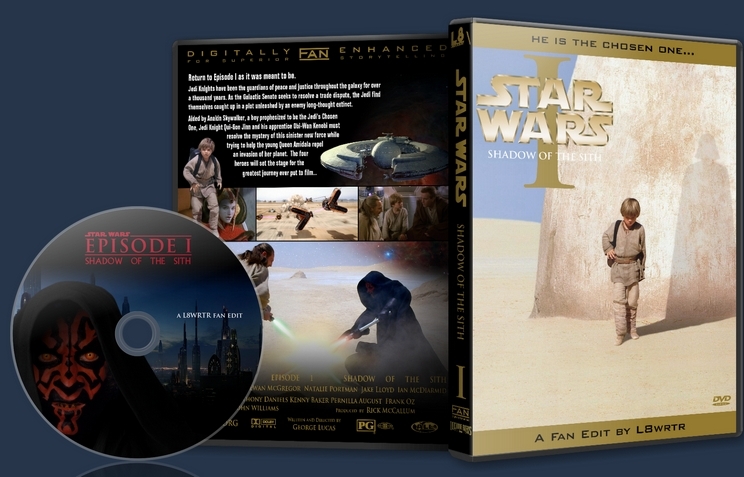 3) Modify/remove aspects introduced in the Prequels that I don't feel match with the Original Trilogy. In the L8wrtr trilogy there are no midichlorians, Darth is not a Sith title and will not be heard until Vader is Knighted in Episode III, and R2 never, ever flies. Special thanks for invaluable help with the initial release: Hebrides helped color correct the deleted footage to match Adywan's work as much as possible, TV's Frink provided excellent guidance and ideas which helped refine/focus my approach to my first edit, Remixed by Jorge unwittingly became a first-class mentor and technical guru and lastly, a huge thank you to The Man Behind the Mask for rejecting my first submission. His detailed notes and made this a better fanedit, and made me a better faneditor. With the 2012 remaster, special thanks to Q2 for guidance on working in HD and up-converting standard def material, and NJVC for graciously volunteering to create the beautiful menus for the BD disks, which then became the basis for the standard def releases as well. - Drastically improve the many flawed characters as much as possible. 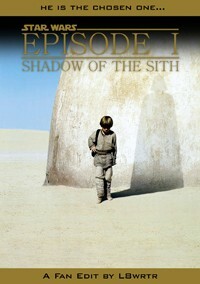 - Restructure the narrative so that Anakin Skywalker is the true hero of the film. My approach was to be as ruthless as possible when cutting out dialog and story-elements which were redundant, pointless, or detracted from the audiences ability to like/engage with a character that they came to the movie wanting to like. The same applies to pacing. The original film drags and lacks urgency. Boss Nass: Most critics of the Phantom Menace tend to focus their ire on Jar Jar Binks, and without a doubt, his character is the most obvious flaw in the movie. However what often gets lost is that Gungan race itself which was poorly conceived, particularly as a warrior race. Only Captain Tarpals was tolerable or believable. My goal was to make the Gungans more ominous by removing as much of their bad dialog, slobbering, howling and shaking of lips as possible. They are now presented as distrustful of outsiders. Binks is going to be punished for bringing outsiders to Otah City rather than returning from banishment. The Jedi escape punishment for trespassing because they use mind-tricks (Jar Jar and a guard now share a shocked response when Boss Nass agrees to let them go and give them a Bonco). Jar Jar Binks: Jar jar has been heavily edited to remove nearly all of his annoying screen presence. I removed toilet humor and as many antics as possible without removing key plot points or creating continuity errors. Because he owes Qui-gon a life-debt, he must follow him everywhere, similar to how Chewbacca shadows Han Solo. He quietly follows him and now no longer inserts himself into every scene possible. I completely removed the sub-plot of him being a bumbling idiot who was banished for being clumsy. The original movie plays this up but with no payoff outside creating an excuse for why he’s out wandering around dry land, and creating an excuse for his antics. As much as possible I sought to reduce their cowardice. I worked to make them more active participants in Palpatine’s plot. While we still never find out what they have to gain by aligning with him, it doesn’t matter. Because they now behave in a manner that appears to have unspoken motivation, we don’t have to care about why. They made a deal with the Sith Lord, somehow he can manipulate the Senate to their advantage. Whatever they each get from the bargain is immaterial. This was largely achieved by removing their continual effort to justify their actions, both to outsiders (the Jedi and the Queen) as well as to themselves (constantly asking Palpatine if it’s legal). They simply do things, because that’s what bad-guys do. Improve the pacing of the movie by getting to the point ASAP. When I first saw TPM I remember being confounded by the leisurely pace of the Jedi in trying to get to the queen, and lack of urgency on Tatooine. The two biggest offenders of this are the Planet Core and Pod Race sequences. The Planet core is gone entirely and the Pod Race is reduced heavily, including the Hanna Barbara announcers, all of the cartoonish sub-plots of how various pods blow-up/get disabled, as well as all of the slap-stick during the race. The race is now fast and focused. Almost every scene has some modification to it in order to eliminate either redundant and/or obvious exposition as well as poorly written and/or delivered dialog. The only two scenes with dialog that emerge unscathed were the interplay between Palpatine and the Queen (the only scenes in the movie that are strictly between two living, breathing quality actors). I think this is one of those areas where the original Phantom Edit was far too conservative. Virtually every scene is now tightened. There are two parts to my work here. The first is the simple and obvious one first pioneered by Mike Nichols, improve Jake Lloyd’s performance by eliminating as much of his dialogue as can be reasonably done. I don’t think I did anything revolutionary here. Anakin is presented as much as possible as a boy of action and confidence. Gone are the yippees and woohoos. The insertion of the Greedo sequence also helps show that he’s not a perfect angel, also I removed the terrible line by Schmi about him knowing nothing of greed. I have recut Act 3 so that Anakin is truly the hero. In the theatrical cut, Padme and her team are the victors/heros. By capturing the Viceroy, she wins the battle because once captured the battle is effectively over, and Padme states as much by informing him that they will now discuss a new treaty. Now the queen’s double never arrives, she never gets the upper hand, she is captured. Qui-gon is dead, the gungans have been captured, and Anakin is marooned inside the Trade Fedaration ship.. there should be only one hero, and now the Chosen One is the hero. Eliminate the Disney Main Street Parade. This sequence has no place in a movie titled THE PHANTOM freaking MENACE. The immolation scene is perhaps the best in the entire movie, it lays out everything that has happened and setting up the players of the next two movies. This should have been the final scene. Now it is. - New Title and Crawl. No more disputes about taxation of trade routes.. blah blah.. there is a dispute between the Neimoidians and the Naboo, the Neimoidians have set up a blockade.. let’s go. - Eliminate Midichlorions. 'nough said. - Eliminate the title of â€˜Darth’. He is simply referred to as an apprentice, or Lord Maul. My hope is to eliminate Darth as a generic Sith title throughout the PT, leaving Darth Vader as a truly unique Sith Name. I’m not sure it’s possible but time will tell. At the least its removal doesn’t worsen the movie, and could pay off later. - Eliminate entire scene with the fake Queen hearing pro/con arguments of going to Tatooine and telling Padme to clean R2, and of course, Padme cleaning R2. We already watched Qui-gon and Captain Panaka debating Tatooine, so its duplication before the Queen is just useless and we also lose the painful interaction of R2′s introduction and the fake queen ordering her superior to clean a filthy droid. - Cut Wato saying he’s immune to Jedi Mind tricks. Both Episode IV and Episode VI establish that the force can influence the weak-minded, but not against the strong-willed. Wato is many things, but weak-minded is not one. We’ve seen OT, we get it. This was the second-most controversial cut, but again, if you hadn’t watched the movie before, you don’t miss the clumsy explanation of why the mind-trick doesn’t work. If Wato is smart enough to know that Jedi’s can do Mind-tricks, he should probably be suspicious of an off-lander acting like he is doing mind-tricks, and certainly not consider getting into bets with a possible Jedi who just tried to trick him into accepting useless credits. - Eliminate the crowd of kids while Anakin finishes his pod racer. Horrible scene that takes you out of the movie. With Anakin being so advanced that he can build a droid and pod racer out of free junk, I felt it appropriate to not have him be an obviously social kid, this is further reinforced by his fight with Greedo. - Eliminated sequence of Qui-Gon talking to Wato in the box after the race. - Eliminate scene of Nute Gunray on walking thrown taunting Governor Sio Bibble. - Eliminate hill-billy Sand People firing at the pod race. While this was a genuinely funny scene, I feel that it conflicts with the Tuskin Raiders in Episodes II and IV. These are vicious creatures who are key in Anakin’s journey to the Dark Side. Using them as a quick joke in TPM just feels out of place to me given the context of the full saga. Of all my cuts, this was the most controversial among my previewers as it was one of only a handful of fun moments they remember fondly. But ultimately it doesn’t really add anything to the story, if you’ve never seen it, you’d never miss it, so with that as my ultimate standard, it was deleted. - Recut Anakin’s goodbye with his mother for greater emotinal impact as well as eliminating reference to returning to free her. This promise is not fulfilled and is wishy-washy. The scene is much stronger without it. - Reinserted portions of two deleted scenes; Anakin/Greedo fight (replaces Jar-Jar/Sebulba sequence) and the Sith Probe Droid, not only does this make their running to the ship understandable, for the first time in the movie, our characters have a sense of urgency and dread. - Eliminate as much of Ric Olie’s dialog as possible. This guy’s delivery made Cpt. Panaka (Hugh Quarshie) seem like an Acadamy Award winner. All Ric ever does is explain to us what is going on, but the visuals already take care of this, and much more convincingly. - Remove Obi-Wan’s non-sensible rant about symbiotic relationships which is not explained, and has no payoff. One of my favorite fanedits of all time. With a full grasp of the story that needed to be told, there was an enormous amount of thought and research that went into all 3 of l8wrtrs trilogy. Every single edit has a reason behind it in support of pacing, story, and characters. Underneath the phantom menace, L8wrtr proves there is an interesting story. L8wrtr transforms a terrible film into an interesting and enjoyable first entry into the Star Wars Saga. This trilogy as a whole makes watching the saga in order (1-8) worth your time. This is the quintessential edit of Episode 1. This edit is absolutely phenomenal - perhaps the best version of the film possible. We can all agree that The Phantom Menace leaves much to be desired, but watching l8wrtr's edit restored some of the joy from the original trilogy. So, what made this edit so great? - Jar Jar is.... bearable? His presence is so limited, and all of his foolishness is removed. Now, he comes across as a competent, if a little odd, alien who comes from a clan of warriors. While he can still annoy us with his speech patterns and ridiculousness, he doesn't come close to ruining our experience. - THE PACE. The film just keeps moving, and this movie needed a bit of a boost. I can't get over the fact that I was enjoying myself as the movie started, because all of the needlessness was gone. - The villains. The Neimoidians felt like a part of the villainy this time around. I didn't realize how much they hurt the film, but when they are willful participants they increase the stakes of the movie. Unfortunately, while there are many improvements, nothing can save the acting in this movie. It's just as dreadful as it always was, but this time... there's less of it. Nobody can make The Phantom Menace as good as the originals, nor as good as what Disney releases now. l8wrtr sure does his darndest, though, and boy does it pay off. My go-to edit for this monstrosity of a Star Wars movie....I do like having as complete as possible a Star Wars chronology; it is interesting that the majority of the films in the chronology are fanedits! L8wrtr has made two films in that chronology I deem essential go-tos (this one and Republic Divided); his Hobbit edit is also one of my absolute treasured miracles of fanediting. Alas, completely salvaging "The Phantom Menace" (my suspicions on the new Star Wars movie began with this title), short of re-shooting, is a mammoth task. Adywan has stated he will no longer attempt to tackle the prequels, and that's fine. Making this film into something that could eliminate 100% the absurdity is just not going to happen, EVER. The tendency for performances in Star Wars movies to be second-tier priorities began in ROTJ, continued throughout the prequels, and was thankfully jettisoned by JJ Abrams. But l8wrtr has made something here worth noting. I don't even remember how much awfulness permeated TPM, since I've been watching only fanedits for years now and comparing them. What do I like about this one compared to others to recommend it first? 1 - no announcers at the podrace. I don't know why people think this is innocuous enough to be left in; it is Lucas at his most shameless. Now, the podrace, sans music, announcers, and in its entirety, is thrilling by any standard. 2 - Gungan City is a necessary component for the movie. It introduces the Gungans, who obviously play major in the final act, and also gives us an explanation as to why the hell Qui-Gon allows Jar Jar to follow him around. Too many fanedits eliminate this scene; here it's kept in and tastefully recreated (although the TMNT Nintendo game antics of Obi-Wan and Qui-Gon swimming in the water are still there). Now we 'get' Jar Jar's need to be around and "me-so" everything. 3 - Anakin is, yes, less annoying (not Jake Lloyd's fault - this is pure Lucas shlock)....and the way the final battle is edited, with Anakin as the catalyst for success against the trade federation (minus his own commentary), is fantastic. 4 - The final scene, at Qui-Gon's funeral, is very, very effective. Leave it to Yoda and Windu to have the final exchange. 5 - The streamlining of the film does indeed make it fast, exciting, and ineffably itself. More on this below. 6 - Jar Jar's antics. Although I do tend to look at Jar Jar with different eyes since all of this Jar Jar as Sith Lord insanity has come to light in forums, either way, he has never been as charming as "goofy Yoda" will always be. What could have been salvaged, but wasn't? 1 - I'm no expert at fanediting, but some things could have been trimmed/changed further - first off, I have seen some very effective fanedits that dub Jar Jar and the Trade Federation dudes. And that work is really, really well-done. Could such work be used here? Sure! 1 - the performances. Ewan gives the film's lone performance worth anything. Liam looks like he'd rather be back in Poland in the snow than in this movie. But the twin terrors of Natalie Portman and Keira Knightley represent the ultimate nadir of the Star Wars universe. One's worse than the other. ANYONE who found worth in Portman based on this performance deserves to be commended, because she is utterly unsalvageable.....but Knightley, seriously....every time she opens her mouth I look for an icepick to jab into my ear, because it would be a far more pleasant, rewarding, and enjoyable experience. I've seen more life looking at my toaster - when it's off. Short of re-shoots (Adywan, where are youuuuuuuu????? ), you can't do anything about this. The 'twist' with the decoy and all that is also unnecessary and silly, but if you're going to have the ending play out logically, you have swallow and endure it. ***On a side note....it is interesting to watch the film and notice the pacing. 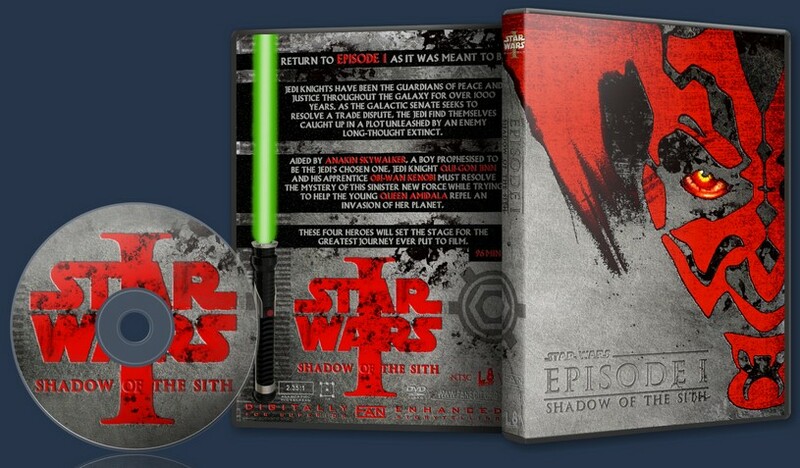 At 96 minutes, this is a fast, streamlined Star Wars. I'd like you all to imagine GL releasing this exact version in the theater in 1999. First off, there would be a LOT of talk about the runtime. 96 minutes would indeed match GL's retrospective dismissal of TPM as a "jazz riff", but would the narrative ***flow***? I would imagine there would be a lot of talk of lack of "padding", those obligatory shots professional directors and editors need to establish "down time" between characters and build relationships. This edit moves so blindingly fast that we have little time to process all of these new characters, vision, and scope...but that's a good problem to have! If people want more, you've succeeded on some level (check "Raiders" or "The Maltese Falcon" for ultimate examples of success along these lines). An edit like this would have been received certainly with a high amount of excitement and bewilderment, and since the cheese is gone there wouldn't be too many distractions (Knightley aside). Still, what could a faneditor do with the ultra-cheesy source material? Everything that has been eliminated is necessary to make TPM watchable. I think any self-respecting editor understands the value of these scenes - certainly L8wrtr gets it when it comes to his beautiful, immaculate Hobbit edit. I've introduced my 2-year old daughter to Star Wars via a lot of fanedits, and this is another. She loves the pod race. This kind of approval is where it's at, as far as I'm concerned. L8twrtr, thanks for these continuously enjoyable gifts. Star Wars is too much fun and, dare I say, important, to be left in the doldrums of the original cuts.